Almost 1 lb of cultured butter, plus over 2 cups of buttermilk from 1L! Chalk this one up to the experience, as opposed to a massive cost saving measure. It costs a few dollars less ($5.49 for 1 L cream versus $8.00 for 2 packages commercial) than purchasing it. So I guess it does save some money, and it's also satisfying to make! This one was fun to do, if a bit messy. As the liquid came out of the butter I had to resort to using my mixer’s splash guard. But it was a small price to pay for nearly one pound of homemade cultured butter. I "cultured" my cream on the counter with a little yogurt. Making butter at home would be great to do with your kids. They would be amazed. Try it on a rainy day for an indoor activity. There are two main types of butter on the market: regular butter and cultured butter. The first is made from cream that has been pasteurized. Very good, and can run you anywhere from $3.50/lb on a good day to around $5.00. It depends on the brand, and what sale may be offered. Cultured butter is different. Usually it is sold by the half pound at approximately $3.99. 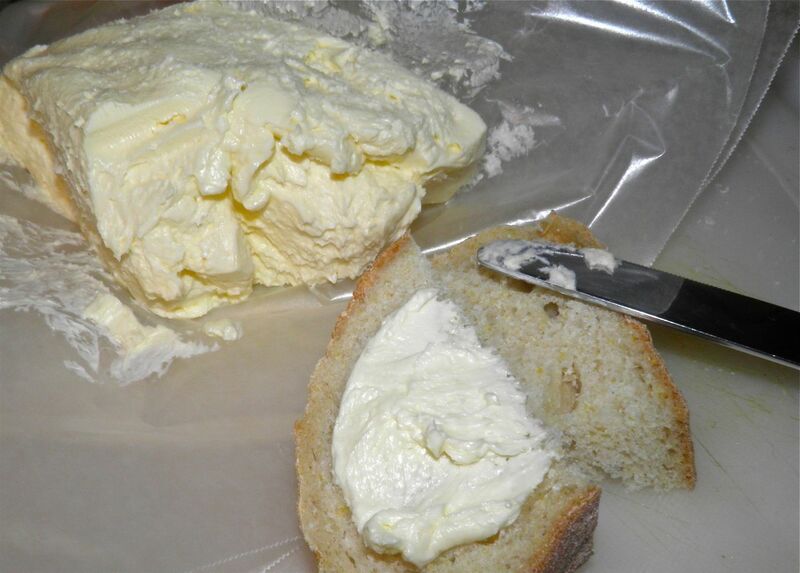 Commercial cultured butter has bacterial cultures added to it to give it a more homey, country taste. It’s meant to mimic butter that was made on the farm. When people made butter on the farm they used to have to collect the cream over several days. This meant the older cream would sour somewhat as the proper quantity was collected. This souring gave the butter a delicious tangy taste. When making cultured butter at home, you have to artificially introduce culture. This is done by adding yogurt to the cream and letting it sit on your counter. Don’t worry, it won’t “go bad” during the time it matures. The good bacteria in the yogurt help in that regard. This step can get a bit messy. You're whipping 1 L of cream. The result of culturing on the countertop is that you can adjust the taste of your butter. The longer it “sours” the tangier your butter will be. I left mine on the counter the whole day I was at work, but my home was a little cooler than 70°F, which is normal room temperature. The souring works best at 70°F, or warmer. The warmer your room, the faster it will culture. The cream will thicken slightly and take on a slightly (very slightly) sour smell and taste. Have you ever wondered what would happen if you whipped your cream too long? Well, here’s the result. When you make your own butter it goes through some defined stages. First it whips, then it separates and becomes “grainy,” and finally it whips into a luscious buttery mass. The original recipe called for 1 pint of cream. I doubled it to make nearly 1 lb. Go big or go home, I say. This actually yielded two products, the butter and well over 2 cups of buttermilk. This butter is sweet, yet a little tangy. I was amazed how much it made. I guess I’ll have to make some homemade bread worthy of it! of "buttermilk." I poured off a little liquid two more times. Use good quality whipping cream and whole milk yogurt with active bacterial cultures. Place the cream in a container and add the yogurt. Shake or stir well to combine. (Don’t shake too hard or you’ll start to whip the cream. Cover and place somewhere at room temperature, about 70°F. Let the yogurt culture the cream for a few hours. Taste it to see when you want to stop. The longer it goes the tangier the butter will be. 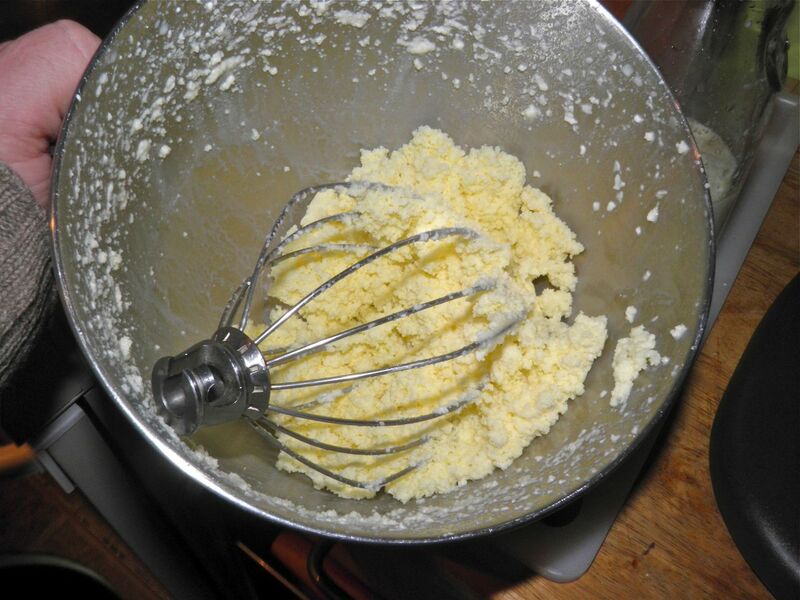 Pour the cream into a mixing bowl. Slowly beat the cream, increasing the speed as it thickens. This will help reduce splashing when using 1 L of cream. but it felt nearly the same weight as a purchased block of butter. 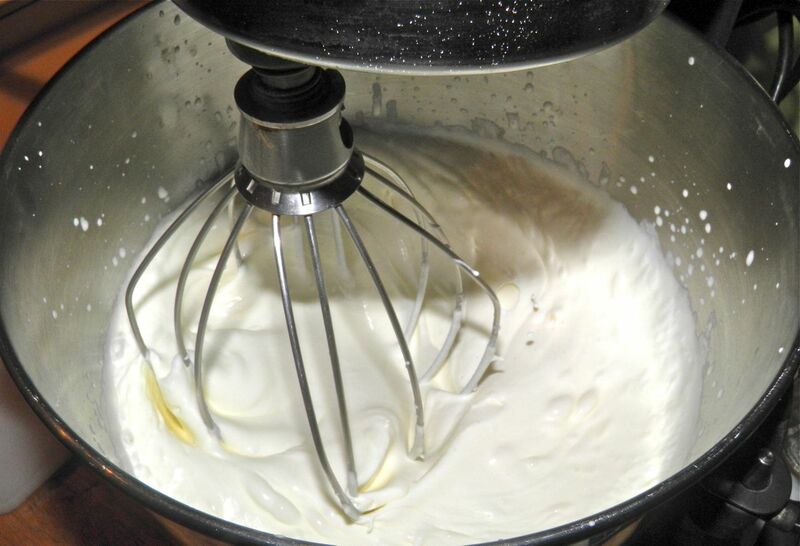 The cream will pass from fluffy whipped cream into a consistency far more “lumpy.” At this point you will see the buttermilk begin to separate from the butter. Drain the liquid off as it collects. Save the buttermilk for another use. 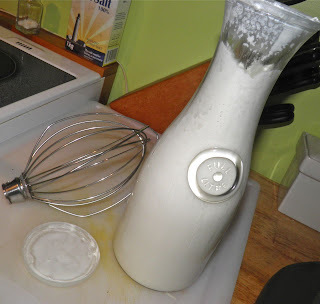 The whole process will take anywhere from 6-10 minutes depending on your mixer. The KitchenAid finished the job in about 5 minutes, but that's because of the planetary action of the mixer, which makes mixing everything faster. Ahh, KitchenAid – how I love you..
Once it seems that all the liquid has come out of the butter turn the mixer to low. Add 1/2 cup of very cold water and “wash” the butter. Do not beat the water into the butter. Drain the water off (but don't pour it into your collected buttermilk) and knead the salt in with your hands. The amount of salt you use will be up to your individual taste. Drain off any additional liquid that appears as you knead, if any. This butter is best on bread or vegetables where it can be appreciated on its own. It’s a bit tricky to bake with it as the moisture content is different than commercial butter. That probably won't stop me, though. 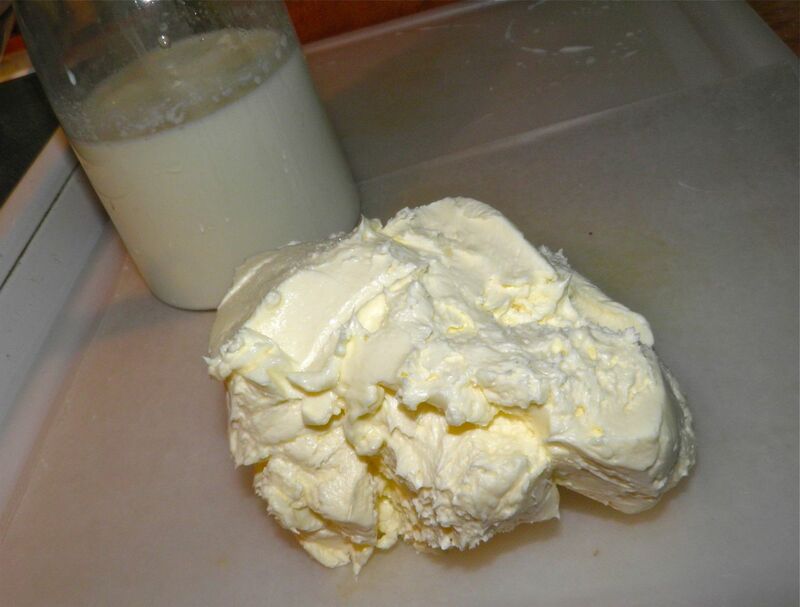 Cultured butter will keep in the refrigerator for between 7-10 days.